Widely sold as cut flowers, Carnations plants are also popular as garden plants, although slightly different varieties are mostly used. 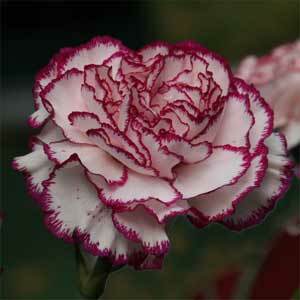 Growing Carnations is not difficult, they do well in raised garden beds and should not be mulched. Carnations are a much loved and we think, underrated plant. Carnations make fantastic cut flowers, look great in the garden and are actually fairly easy to grow. Flowers are generally large 5 – 8 cm and many grow on long stems which make them great for picking as cut flowers. 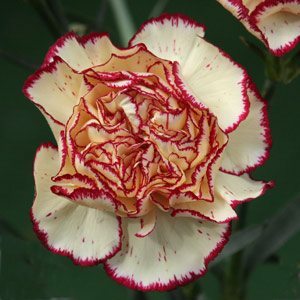 When we talk about Carnation flowers we usually mean the Border Carnations, these are cultivars of Dianthus caryophyllus and have larger flowers and longer stems than the species. The flowers of these pretty plants will last much longer when cut, if glucose enriched water with a dash of bleach (we use ‘White King’) is used. Long lasting blooms with a nice fragrance make carnations a favourite in corsages and floral arrangements. Full sun and a rich well drained soil are the best growing conditions and carnations make great border plants and look great in rock gardens. Carnations are suitable for growing in containers and pot sand can be fed with liquid fertilizers such as seaweed based fertilizers. Prune carnations of spent flowers back to the base.